The ear whispered, the fingertips touched, and on February 14, another heartbeat. “214 Sound Color” Countdown 3 days, nice, fun. 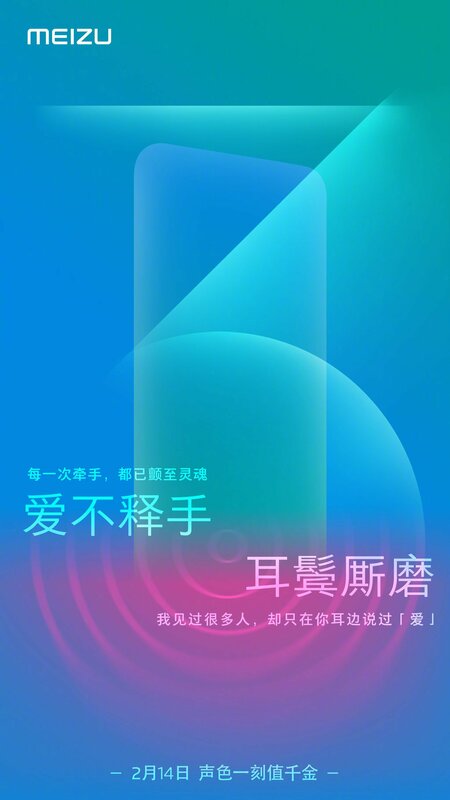 The official poster shows that in addition to a mobile phone outline map, and there is a “3” abstract logo, the current official does not reveal what the new product is, but there are many netizens in the comment area that Meizu will release a new headset, there are also Netizens speculated that Meizu’s new machine Note 9 will be equipped with dual speakers and will be released on February 14. However, from the current news, the possibility of mobile phones does not seem to be very high, and some netizens analyze that Meizu will launch a new voice assistant. Of course, the above are just speculations. The specific situation needs to be officially announced. Yesterday, Meizu’s new poster appeared in “Record of the Year”, “Album of the Year”, “Song of the Year”, “Best New Artist” and other things related to music or music. These names are all Grammy awards. Is it necessary for Meizu to cooperate with the Grammy Awards? It is worth mentioning that Meizu Note 9 has officially landed in the Ministry of Industry and Information Technology today , and the ID photo has to be exposed. It seems that Note 9 is ready to go, but the Meizu official has not disclosed any information about the launch of the aircraft.